This page is for making a comment, general chat, or whatever, if it doesn’t fit anywhere else. The ‘STUFF’ page is not working properly. Please Do Not put anymore comments on this page. Please use the Confabulation page instead. You can find the link at the top beside Tidbits From Edgar Cayse. Salty, I deem it not impossible that we sort of out of our own choice decided to experiment at some point and eventually mistakenly wound up and got trapped in a dense world where we are now, and have forgotten our true heritage and origin. But then, where is this evil, parasitical force coming from? That force seems to have a very cunning and deliberate agenda and modus operandi. That cannot be explained away by a sheer accident, I think. So, in that perspective I deem it quite well possible that this material world is a set up by a delusional force, the dark force if you will, from the start, purposefully designed to trap and exploit beings from the true original state OR was mistakenly created by a somehow delusional and illusional mind. I cannot be fully sure about this, but it certainly makes sense to me. Although, I think there is actually not such a big difference between my hypothesis above and yours, I’m thinking. By the way, by ‘myth’ I didn’t mean to say a made up story. I do think Atlantis really existed, and I have believed it was here on this earth for many years too – situated in what is now the Atlantic Ocean – but certain information I’ve come across made me to reconsider this. Right now, I’m leaving this a bit in the middle. There certainly must be something about Atlantis, that seems quite clear. Anyway, I certainly think it is important to break the spell of the Serpent, the archons. …Seeing the truth and really understanding our position is one of the key elements in getting out from under the archonic rule; I suppose that is true. But then, when do you see the absolute truth of ourselves, our circumstances and our world? How honest are people actually about themselves and this world? For example so-called ‘truthers, and members of the so-called truthmovement don’t strike me as being truly awakened who see the absolute truth of this world. They are programmed to believe they are awakened earthdwellers that see the truth, but in my perception they are often operating on quite a low level of understanding. They for example seem to place a lot of value in this world, which I do not. I wrote that this world is not about me. What I try to convey is that I don’t and simply cannot identify myself with the basics of this world. They frighten me. Basics like built-in transitority, decay, cycles, death, life feeding on life, as well as the constant need to do survival things where you are never done with. The basics of this world are injust and cruel, in my perspective. Martijn says >>> Salty, I deem it not impossible that we sort of out of our own choice decided to experiment at some point and eventually mistakenly wound up and got trapped in a dense world where we are now, and have forgotten our true heritage and origin. But then, where is this evil, parasitical force coming from? I’m answering this according to my recall of the E C material for the most part, and I think more is said in the material but this is at least partial answer. Incorrect use of forces. As Polly has said Karim and the other BioGeometry guy say incorrect use of electricity. This agrees with E C.
That force seems to have a very cunning and deliberate agenda and modus operandi. That cannot be explained away by a sheer accident, I think. You are correct it’s no accident. Tptb know what they are doing, but most people don’t know the harm caused by this. So, in that perspective I deem it quite well possible that this material world is a set up by a delusional force, the dark force if you will, from the start, purposefully designed to trap and exploit beings from the true original state OR was mistakenly created by a somehow delusional and illusional mind. I disagree. I do not think this world was created and set up to be a trap from the beginning. However tptb know how to make it operate to do what you say. I do not think this world was mistakenly created by a somehow delusional and illusional mind. I agree that it does seem like that a lot of the time. I can’t be 100% sure of anything either Martijn but that is where my thinking is at now. Gurdieff is a smart man!! He agrees with me!!! LOL! LOL! I’m making a joke: I agree with what he says..
As I said in the “Psychic who said…..” thread I think seeing the absolute truth of ourselves, our circumstances and our world is not possible right now. I think one should not overly value the material. In the E C material that’s what got us stuck here in the first place but there is value in being here. Opportunity. I hear you Martijn and I don’t like it either. It is what it is. What can we do about it? This is where my thinking is at on this. As we individually work on the spiritual, and as we move forward things will change for us individually, and as people en masse do this there will come a tipping point where things in this world will change. Re “things will change for us individually” I mean that for example we will gradually become more calm / peaceful inside, and will not dwell so much in, and on the negative, will have have a more positive outlook. We will attract more positive energies, and people. I’m just letting you guys know that I just made a new page for E C material. More info about it on that page. “Was DNA engineered by regressive aliens to repress the full expression of human nature that includes sexuality? DNA fractal patterns consistent with regressive alien artificial intelligence alluded to by Dr. John Lash. Martijn, It certainly is a puzzle! It looks like he is on to something. The article is a long one and I don’t have time to read all of it. I’ll try to read it when I have time. People have different meanings in mind for what Alien and Extraterrestrial are. To me Aliens and Extraterrestrial are physical beings from another planet in our system and in the same dimension as us. I think humans have been messed with by beings from a different dimension (ED’s) in the far far distant past, and it’s still going on today and probably with the help of some humans, and some of these humans are knowingly doing it. I also think that way back in the beginnings Earth definitely was not the same as it is now, nor were people. The words ‘regressive aliens’ makes it sound like the aliens are less advanced or backward. LOL! I don’t think that’s what is meant though. The E C material talks about everything in your comment and more, and as I come across mention of these things I will put it in that thread “Tidbits from Edgar Cayce”. I think ‘regressive’ in this context must be read as evil and negative of intent. Alien is another word for foreigner, outsider or stranger, isn’t it. It can be used for all that is looked upon as foreign, strange or coming from outside! Martijn says >>> I think ‘regressive’ in this context must be read as evil and negative of intent. Becoming less advanced; returning to a former or less developed state. Of, relating to, or marked by psychological regression. In my thinking the aliens talked about in this article are not themselves regressive (backward) but caused us to regress. As I said before, I did understand the article did not mean it that way. >>> Alien is another word for foreigner, outsider or stranger, isn’t it. It is but when it is used that way it clear that illegal aliens (people in a country illegally) are being talked about, and it can and is properly used to mean outsider or stranger too. You are technically correct. Like I said I did not read the article and from other articles I’ve read and from listening to interviews when they talk about aliens manipulating us they mean for one example the Grays, etc. Yes it can simply mean someone / something other than us humans. Anyway, like I said “People have different meanings in mind for what Alien and Extraterrestrial are. To me Aliens and Extraterrestrial are physical beings from another planet in our system and in the same dimension as us.” so that is where I’m coming from in my reply to you. There are many bits of info in the E C material that you may find Very interesting! I have put 2 links there (in the first post) so far, if you are interested start with the other link Not the E C / ARE site one. Yes, Edgar Cayce has produced quite a lot of information. Sometimes the information is a bit too long-winded for me, and here and there too ‘new agey’, as far as I’m concerned. >>> Yes, Edgar Cayce has produced quite a lot of information. Sometimes the information is a bit too long-winded for me, and here and there too ‘new agey’, as far as I’m concerned. Martijn, I know what you mean when you say ‘new agey’. I’ve come across that while reading his stuff too. However, it seems to me that what is thought of as ‘new agey’ stuff is not new. It is very ancient. The matrix repeat. A LOT of what has been recently discovered, and, or is being talked about now, is in the E C material. For one example the article link you posted. I didn’t read it but I scanned through it and I had just been reading about that sort of stuff in the E C material. So, I’m thinking that from what I’ve been hearing and listening to recently it sounds to me like they have been reading his material too! Or, just catching up with what he said/knew decades ago! LOL! There’s nothing new under the sun. I know the E C material is not perfect but neither is anything else we get from anyone, or anywhere else. The wording in the readings is difficult, and I’m not perfect at deciphering it that’s for sure, and even E C has said in the readings that there are no words suitable to convey what he is trying to explain. However one does start to get the drift of it after a while. Anyway Martijn, regarding your first paragraph, if you ever choose to read the E C material it could be a base for discussion on these sorts of things as we would both know where each other is coming from. I am Not trying to pester you into reading the E C material. I hope I don’t come across that way. The EC material looks somewhat biblical and Nostradamus like (lol) by the manner it is composed. It’s a bit strange and puzzling; it certainly can be confusing when reading it. No, I don’t feel like you are trying to pester me into Edgar Cayce, Salty. Yes, Edgar Cayce covered a wide range of subjects. I will see what more I could read of EC soon. A few days ago the weather cooled down to what is more normal for this time of year and maybe a bit cooler than the norm. It has been in the high teens C and is forecast to be in the high teens – low 20’s C for the next few days. At this moment George Knapp is on Clyde’s show. I love George Knapp!! He is really on the money, is so well-spoken and well-researched and he just gave an excellent talk before phone calls. He is a superb and top-notch investigative journalist of the real kind and I cannot say enough good about him. Back to my listening in bed!! I like him too. I didn’t know he was on tonight or I would have listened. I’ll listen to the podcast tomorrow. I don’t know how long he was on but I what I did catch was really good and was either the end of it or he was only on for a few minutes because he was gone after I posted what I did above. He talked about how we are living in someone else’s world, that everything we do is watched by these beings or intelligence, they are always one step ahead of us, and we can’t do anything about it. He was citing a case at some ranch that begins with an S. The people who live there had these experiences that he described about being watched constantly, etc. Rosemary Ellen Guiley has talked about how the Djinn used to live on this planet, they lost a war for this planet, went into another dimension and have been influencing us since. Just a reference!! It’s called the Skinwalker Ranch. >>> …. that everything we do is watched by these beings or intelligence, they are always one step ahead of us, and we can’t do anything about it. He was citing a case at some ranch that begins with an S.
I agree with that, and that’s probably who the ‘Recon Guys’ were. A couple of days ago I changed the way comments appear from oldest first TO newest first. Which way do you guys like best? The old way of oldest first or the way it is now with newest comment first? Having the newest comments at the top of this particular thread is better, imo. Hi Salty, I don’t know what is better, the last post on top or the last post on the bottom of a thread. Perhaps the last post on the bottom works better, because you can type your reply right under the last post. Yes, I think I would prefer it that way, the way you had it. The allergies are almost gone but I’m still not feeling that good yet and I think it has to do with when I got walloped when the power went out. More about that at another time. Today no matter how crappy I feel I have to catch up on some housework before I poop out. I’ll see how it goes for a while longer and then decide. Salty, I hope you are able to throw off the effects of being zapped the way you were. I know I have been through many similar experiences of being zapped and I know it was no coincidence. You must have done something right. LOL!! Either way you have the comments set up is okay. Polly, I hope so too, and I hope it’s soon!! I’m working on it. Salty, please forgive me but it’s like you were actually burned with some sort of radiation that day (my thought all along) and when the sun warms things up in your apt. your symptoms flare-up. Do you know what I mean?? It’s like if you got a painful sunburn and then went and stood in the sun the next day. The heat from the sun would irritate the sunburn. My goodness!! Your description of what it feels like is an excellent one! That’s exactly what it feels like!! A horrible sunburn inside my body. One thing though, as far as I can tell right now it is not the heat that is the problem. It is the sun itself. For example I get relief when the sun is covered by clouds, but the temperature in our apartment does not change. Also, it has only been in the high teens to low 20’s for several days, and today so far it is overcast and I’m not too bad off right now but I can still feel some of the driving force of the sun’s rays but not the intense burn. The sun would be shining on the balcony now if it wasn’t cloudy. It seems the arc of the sun has something to do with it. Maybe the radiation hits me stronger as the sun moves west and the direct rays of the sun hit me / our apartment. Got it!! I was thinking a sunburn on the inside of your body, too. It may have been microwave. Your husband was right there and he wasn’t effected so it seems like it was meant for you. I’ve heard of people being targeted with microwave beams and they burn. Doesn’t, for example, a microwave oven heat from the inside out of whatever is being heated?? I’m just guessing but I’m going by what you have described so far. Not only that, but we are still having a lot of solar activity interaction. (Those blasted protons!!) Can you think of anything that might help?? Baking soda bath?? My God, it’s that cold there?? Was that F or C?? Don’t worry about me but I have a terrible case of the heebie jeebies today. The pain get so unbearable sometimes I have to take acetaminophen and I hate the side affects!! I’m going to buy some Epsom salts and soak in a bath bath. I have used Epsom salts for relaxing muscles before and it help quite a bit. I hope it works for the burn too! That sounds like quite a heavy experience, that power hit you got. Since I got walloped when the power went out May 6 something weird and very painful has has been happening. As I said back then I had a burning headache and all the muscles in my body felt like they were on fire. Since then, when I get up in the morning I feel not too bad, then when the sun comes around and starts to shines on our balcony my muscles start burning, the burning headache comes back, and I experience an energy drain. That’s weird! This has happened every day since then. If the sun goes behind the clouds I get some relief but when the cloud cover goes away the pain increases again. WTF is up with that??!!! I have a few more things to catch up on today before the sun hits the balcony 😕 😡 but I won’t be away from my pc as much as yesterday. It sounds also to me like a microwave ‘treatment’ you got. Microwave radiation boils or heats matters on or from the inside. At the moment I cannot really suggest an adequate remedy for the symptoms you describe. Microwave is as good a guess as any I suppose. Whether it be microwave or some other radiation or energy, what it did is make me excruciatingly sensitive to the suns rays and I hope it clears up soon!! Polly, I’ll let you know. Earlier this week the skies started to cloud over, then we had a heavy rainfall warning and it rained buckets all day! It was almost that bad the next day too so I’ve had a nice break from the sun’s rays and time to heal. When the clouds parted this afternoon I didn’t have near as much pain. The sun’s rays didn’t feel anywhere near as driving as the were and the burn was hardly noticeable. There is a lot of clouds and rain in the forecast so I’ll have a chance to to heal more. I’m happy to say that I’m about 97% better! Oh boy, wait until you see this!! About 3 or 4 years ago while I was walking downtown I seen a strange looking tree growing. In the fall it had big long dark brown seed pods! I’d never seen a tree with seed pods like this before and I loved the look of the tree and it’s leaves so picked up some seed pods intending to see if I could grow one of these trees. In January this year I finally got around to planting one of the seeds. Last week it sprouted and it’s about 2 1/2 inches high now. It’s called a Honey Locust Tree. You are breeding a little bonsai tree in your home, Salty? It certainly looks like a nice tree. Not too high and big. Those honey locust trees cannot be found in Europe, I think. I never heard of that name before, and can’t find a translation of it either. Locust is a synonym for grasshopper, as it appears. The Honey Grasshopper tree. I love bonsai trees!! I love all trees!! But I’m not going to do that. I’ve been thinking about it though. I haven’t got a clue how to grow a bonsai tree but I might look into it at some point. Some say that the beans from the Honey Locust tree are what John The Baptist ate, not locust’s the bugs. I don’t know why they use the name locust but the honey part of the name is for the sweet tasting pulp found in the seedpod. I like the Honey Locust tree leaves, they remind me of ferns. I love ferns too lol. Sounds like a fun thing to do, growing and creating a little bonsai tree yourself. I wouldn’t be able to tell how that could be done either. By heart I would say, make sure you are trimming the young developing plant/tree on a regular basis, but without destroying the entire plant/tree itself, of course. There are several grey poplar trees on the front part of my home. And whe In stick my head out of the window I could also catch a glimpse of a weeping willow! Not a very spectacular one though; rather small and modest. Weeping willows are nice trees, especially when they are partly hanging over a pool or stream of water. Those acacia trees can mostly be found in Africa, I think. 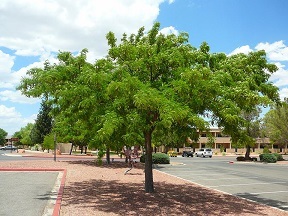 Btw, the leaves of the locust honey tree remind me a little of a laurel wreath. There are links there to other articles etc. Here is one of those pages. There is a warning in the book “WARNING, READ THIS FIRST BEFORE READING THE BOOK. IF THERE IS ANY CHANCE you the reader have had mind-control done to you, you must consider the following book to be DANGEROUS. I don’t know much about Fritz Springmeier, and these books are old, but they may still have useful information. I’m not sure but I think this book was published in 1996. That is quite an expensive book, Salty! Yes, I know of Fritz Springmeier’s books and presentations. I think especially the parts on mind-control are pretty good. He has a massive Christian flavour attached to a lot of his writings which can be quite annoying. He often quotes and refers to passages in the bible and he hangs a lot of his views on what is written in the bible. It’s sometimes like he takes the bible as the absolute truth and forms and moulds the rest of the story around what the bible says. Excuse me a sec. I just read a comment in which someone said the StartPage search engine will be coming out with StartMail. I’m going to keep an eye out for it. It’s in beta testing right now. She mentioned that about a year or more ago on Coast and earlier this year too I think. Montagraph doesn’t seem to think much of StartPage and is going to do a video response to what someone commented about it doing searches by proxy. The comments are under his latest video about the YouTube Glitch Solution. I knew Google and YouTube were blocking IE from working correctly!! I rarely use start page but I find it very useful sometimes, that is if it works the way they say it does. I know they enhance it with Google and they say you still have complete privacy but I did wonder if that’s true or not. As for Google Chrome I have No intention of ever downloading or using that browser. There may come a day when Google Chrome is the Only browser that will work correctly. I have the same thought. Google is taking over. I use Ixquick only and have for a long time only because I saw what Google was doing. There are a lot of different search engines. Even people who use Firefox have been reporting problems using YouTube. Whatever!! LOL!! I have never looked any further than IE, Firefox and Chrome. I found Chrome to be the best of them. Google certainly is everywhere nowadays. I think Putin should CRUSH Monsanto if he is truthfully so enraged. I kid not!! I was surprised to hear that Putin and Russian leaders said such strong words. They were protesting Monsanto all over the world last week. A group of neo hippies were meditating against Monsanto in Amsterdam too last Saturday. Yes, they were meditating… in lotus position. It had a strong hippie vibe to me. Hope Putin isn’t igniting a new world war over Monsanto! Duncan and Miranda on Off Planet Radio May 21/13. They may just be talking about their “Energy Healing Retreat and Workshop” I don’t know, I haven’t listened yet. It’s a short interview. I have hives somewhere on my body every day of my life so some hives are not unusual for me. I have systemic allergies. What is WEIRD is that early last week hubby got hives and he never gets hives. Never!! At the same time my hives got WAY worse! We haven’t been ingesting anything different, just the same ol same ol. All I can think of is that perhaps the ingredients in something we have been ingesting have been changed, or that we ate fruit or vegetables that had been treated with something we both are allergic to. A lot of the stuff they use on fruit and veggies doesn’t wash off. It’s in the flesh. If it was just my hives that got worse I wouldn’t be so concerned, but for hubby to break out in hives too, and at the same time mine get worse, that worries me! All I can think of to do about this is to eliminate one thing at a time until we find what’s causing these fiercely itchy hives, the little bastards! In the meantime I’m going to search the internet for a more effective way to stop the itch!!! That must be quite terrible, Salty, having allergies all the time. That is not how it should be. I’ve heard people can be allergic to many things and can have all sorts of allergic reactions. It tells me amongst other that we live in an unnatural environment or are exposed to unhealthy conditions. It’s insane, basically. Yes, most of the fruit and vegetables are treated with chemicals. The last time I had myself severe itches and skinproblems was when I had a terrible sunburn. There ar also people who are allergic to the sun, I’m thinking now. Terrible must that be as well. It seems to me you are quite sensitive and susceptible in general, Salty, which doesn’t make life easier. You’re right Martijn, hives are a TERRIBLE thing to have! I hope we get to the bottom of this SOON!! The power went out again today at 5:32 PM PDT. It was only out for 2 – 3 minutes. I was sitting in the living room and on the spur of the moment I decided to make spaghetti sauce. Immediately I got up and went into the kitchen and just as I got there the power went out. To be sure the power wasn’t going to go off and on again, and zap me, I waited 1 hr after it came on before I would sit there again. Better safe than sorry! LOL! I think that I must have unconsciously sensed what was going to happen even though I wasn’t consciously aware of it. Or, maybe an angel or some other benevolent being put that in my mind and saved me from getting zapped again. I think you had a little unseen help getting yourself out of your chair, Salty, before the power went out!! Saved by spaghetti sauce!! I soooo much appreciate the help!!! I’m watching this now. It is fascinating. In the beginning I had to wait for it to start and then it stopped and started several times before finally playing correctly. It did the same thing on Google Chrome as IE so I had to be patient. She is another person who verifies for me what I have known for years and that is not all reptilians are bad. Hi Polly, An interesting video! I think it was Duncan that also said Crowley was alive. At about 46 min they are talking about the controllers of the new movement of the NWO, the Fourth Reich, and the head of that are the Reptilians , she says something about Obama that I can’t quite make out. Is she saying Obama serves them well? That surprised me about Crowley. Interesting that Duncan said that, too. I’m not sure what she says about Obama. It could be. I’ll listen again. A few of her comments are hard to make out. I sent Kerry a quick email saying I would like to hear more from Erin if possible. I hope I have more to say because she has made some quite profound statements that I have not heard anyone else make. I am listening to the whole interview again. Kerry is doing a free 1 hr Open Q & A Livestream Tomorrow June 3/13 at 7 PM PDT because of all the questions about the latest interviews. I assume that she means because of “A ROTHSCHILD SPEAKS OUT” and “SUPERSOLDIERS-MICHAEL PRINCE AND MAX SPEARS”. I think I’m going to listen to this one too. There have been quite a few views on those 2 videos, 63,653 for the ROTHSCHILD one, and 28,196 for SUPERSOLDIERS. I’m going to listen to the Livestream tonight. If there is one! You know how things go with Kerry! I have to remind myself to check at 10 PM my time to see ‘if it is on’. There have been 20,000 more hits on the Erin interview since I first watched it. A quick comment — one of the most interesting things she said is when she reveals certain information that is not yet ready to be revealed she knows she will be killed. Everything happening to her and that will happen is all deja vu for her. Less than 10 minutes to Livestream. As of right now there are 94 people waiting! I think that’s a lot for one of these! Yep, thanks. I have a window open to it. A repeat is playing. It’s not live yet. She’s on and only 7 min late! Amazing!! Re Kerry’s idea. Someone said it’s a good idea. All they would have to do is go to that site to get info then they can target those people etc etc. You know what I mean? Tptb would love a site like that! There is an Erin Green Hicks in chat. Someone said to her that they liked her interview too. Do you Know if Erin Green Hicks was the Rothschild lady? I just seen that it is her. This might be interesting. I haven’t listened yet. It says J M is the 3rd guest I’m not sure what time, I guess 9 PM PDT but it could be earlier. It looks like they removed some data here in the GOES 8 Proton Flux. Or for some other reason it went missing. It was there when I looked earlier today. The yellow line is missing in the Electron Flux graph too. Just letting you guys know that I changed it back to the way it was before with the oldest comment first. I don’t know yet if I’m going to leave it this way or not. Hi Salty, I was just thinking about making a comment about that! I personally think it is better when the last comment is on the bottom of a thread. It keeps it better organised that way, in my opinion. Geomagnetic Storm just happened and I can feel it big time!! My head feels like there is a balloon in there being blown up. The Electron Flux is decreasing. I’m not sure if I’m remembering this correctly but I think it was S 0 that said when that goes down there is a greater chance of an EQ ?? I just looked and there was a 4.7 in Mexico 29 minutes ago. The proton density was extremely high but is still high now even though it dropped. When conditions are just so and the influx of protons is penetrating the planet, this is when I can experience an extreme drop in mood. It’s pathological in my perspective. I don’t know if the proton density is effecting my hormones or the serotonin levels in my brain, both, or some other combination, but this is when I have the worst time emotionally. I don’t have other symptoms today, just that. Bummer!! 😦 I hope you feel better soon. I guess the protons affect us all a little differently. Maybe the protons hit parts of the earth more in some places than in others too. I haven’t had any mood problems today but I’m having a hard time staying focused on one thing, and trying to do too many things then nothing ends up completed! I hate that!! 😡 I like to finish what I start so I end up exhausted trying to get everything done. But seriously, who knows?? Maybe it does have something to do with reptiles! ? My proton mood disorder (I am hereby naming a new dysfunction – PMD) has eased, which is a good thing. Sheesh!! I think the influx of particles does hit parts of the planet at different strengths. S/0 has shown that in his videos. What you described really well, Salty, is one of the common conditions people with ADHD experience. Lol!! I’ll be out of town for several hours today. It’s really nice outside right now. Reptile and erectile could be linked, as you say!! I’ve heard that commercial many times before so I knew the lines but that is what I heard at first. Lol!! A weird feeling came over me. If that’s what it feels like to have ADHD then…HORRORS!!! I’m so thankful that I don’t have that all the time!!! That emoticon was me, too, yesterday!! Yes, that’s one of the ongoing things that a few people with legitimate ADHD have told me plus I read an excellent book about the subject. I’ve never seen this before. It’s spooky!! Right now it’s 11:02 PM PDT June 8/13. It’s partly cloudy and about 1/4 of the sky is an ugly orangei((sh) / dirty red(ish)/brown(ish) color. The clouds are that color. It has nothing to do with sunset and it’s not northern lights. It’s a new moon tonight I think. I’m going back to bed now and try to sleep knowing that ugly sky is up there. That is weird. Maybe it was heavy protons, so heavy they could be seen!! Lol!! That’s as good a guess as any I suppose. Whatever the cause it was ugly!! LOL!! Maybe it did have something to do that, or whatever other radiations or magnetic disturbances, etc. Whatever the cause it was ugly!!! Did you see the picture of noctilucent clouds at Space Weather today?? On the horizon is a dark, rusty orange color. Is there any similarity to that color?? It was a little like that but darker, murkier, heavier, and much uglier. I forgot to say that the ugly color was not near the horizon but higher up so it differs from the pic in that way too. It makes me think of iron particles in the atmosphere. Speaking of iron, Rosemary Ellen Guiley wrote that the Djinn do not like iron. I’m just letting you guys know that Word Press is acting up today. Pages are extremely slow to load and some will not load at all, the thingamajig just keeps twirling and twirling. I haven’t noticed any problems elsewhere just here on my blog. I hope this comment posts and that the problem clears up soon!! Polly are you having any problems with WP? No noticeable problems with WP for me so far. Knock on wood!! Whatever the prob was it’s cleared up and as of right now it’s working. WP isn’t working properly again today. In my email I get alerts for new likes, followers, etc but they don’t show up on my dashboard and it appears that they are not being recorded here on my blog. The likes do show in the posts though. Pages are loading fine today. It’s been about 3 weeks since both hubby and I broke out in hives and finally they’re gone. I continue to get my usual amount of hives but the severe outbreak has gone, and hubby has not been getting any new ones for a few days now. We had bought a new bag of pepper just before we broke out in hives so that’s the first thing I eliminated and it seems that’s what caused the hives. It was the same brand we usually buy. I don’t know what was in this new bag that was different but I’m going to change brands and hope the hives don’t come back! I’m using some old pepper that I found in the back of the cupboard and we’re not getting hives from it. It will be a HUGE seller. The youngsters will probably go for it. In my travels around the internet the last few days I’ve encountered much evil sick crap out there promoting the dark side. I know it’s always been there but lately they seem to be pumping it out more so. For a long time now I have seen the J K stuff as being both laughable and harmful. I go there once in a while to see what’s up. Mostly it’s been pretty quiet over there and I don’t think so many support him anymore. That’s a good thing imo. Yesterday I went there and he has added ‘Vampires of stupendous size and power’ to the list of who owns us. I haven’t read the comments there. I’m just so revolted and fed up with all the crap and in particular the promotion of the darkness. The SOB’s just keep at it!!! What do you think of the new Word Press look? I liked it the old way but I’ll eventually get used to this new look. I guess the WP problems I was having before was because they were updating. Everything seems to be working fine now. That’s the thing about WordPress: they are constantly upgrading. I have one issue with the way my write a new post page functions (the little drop down menu is in the way of the window where I type) but overall it’s okay. articles. The one that comes to mind at the moment is I thought he did a good job with the one about black-eyed kids. Funny you should mention J M cause I just came here to put the latest J M interview with Gnostic Warrior Published on Jun 14, 2013. I haven’t listened to it, I just ff to see if he says anything about what’s going on. There won’t be anymore shows. If you haven’t listened yet here it is and that part starts at about 1 hr 8 min. I don’t have a drop down menu there in any of the places I can write a new post. That I know of. Maybe there are other places to write a new post that I haven’t discovered yet!! LOL! I don’t recall reading his article about black-eyed kids, but I may have. I see the mistake I made last night. I had J M on the brain and it was late. I’ll reply properly later. It appears the vide has been removed. I even tried Gnostic Warrior’s website. It’s still there Polly, I can see it. It’s working now. I kept getting an error page on IE and Chrome. I will be disabling comments for ‘STUFF’ when I figure out how to do that. I’m going to start a new page. You can find it at the top beside STUFF and Tidbits from Edgar Cayce.